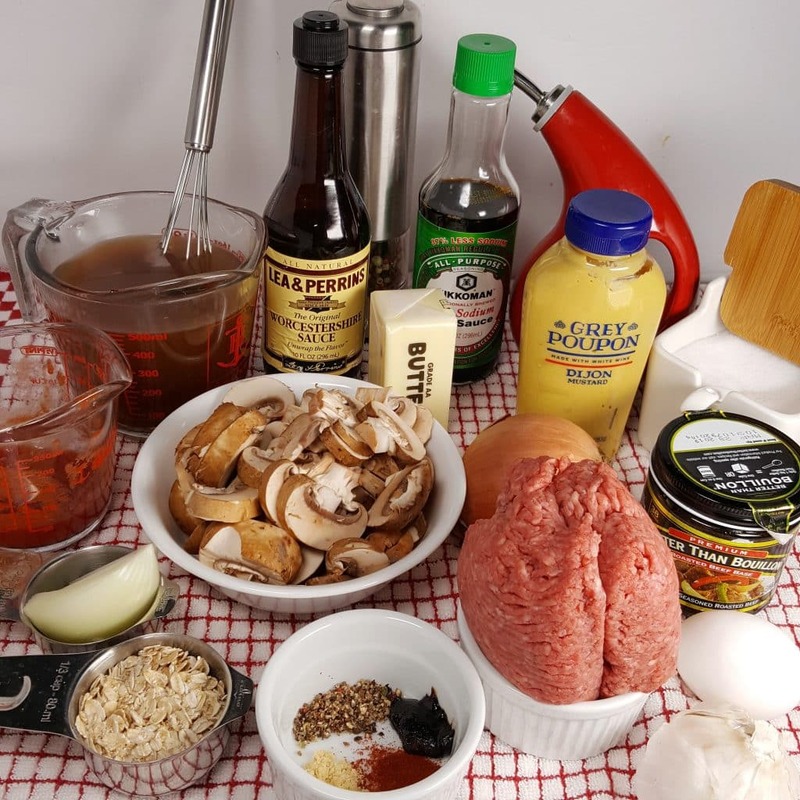 Juicy Meat Patties in a Rich Onion Gravy, covered with Mushrooms, Pressure Cooker Salisbury Steak is a simple meal, made with pantry staples. My memories of Salisbury Steak go all the way back to frozen TV Dinners, served in aluminum trays with compartments. The Salisbury Steak TV Dinner, came with peas, mashed potatoes and a brownie for dessert. It was all about the side dishes and dessert. I cannot even remember the last time I had a TV Dinner. I don’t think they are even called that anymore. Now they can be microwaved, which I imagine, makes it all the worse. 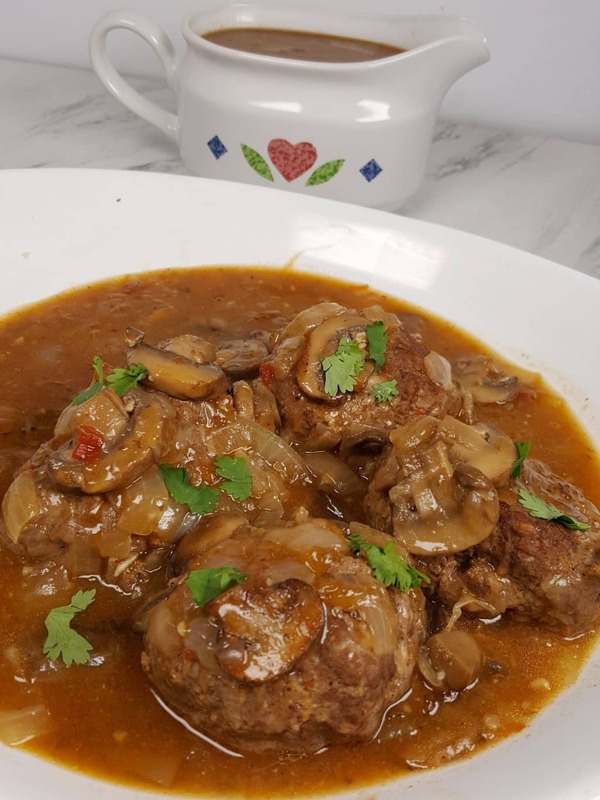 In minutes you can make a rich Gravy in the Pressure Cooker and delicious and flavorful Salisbury Steaks. No need to buy frozen again! Wait until you see the next picture!!!!! 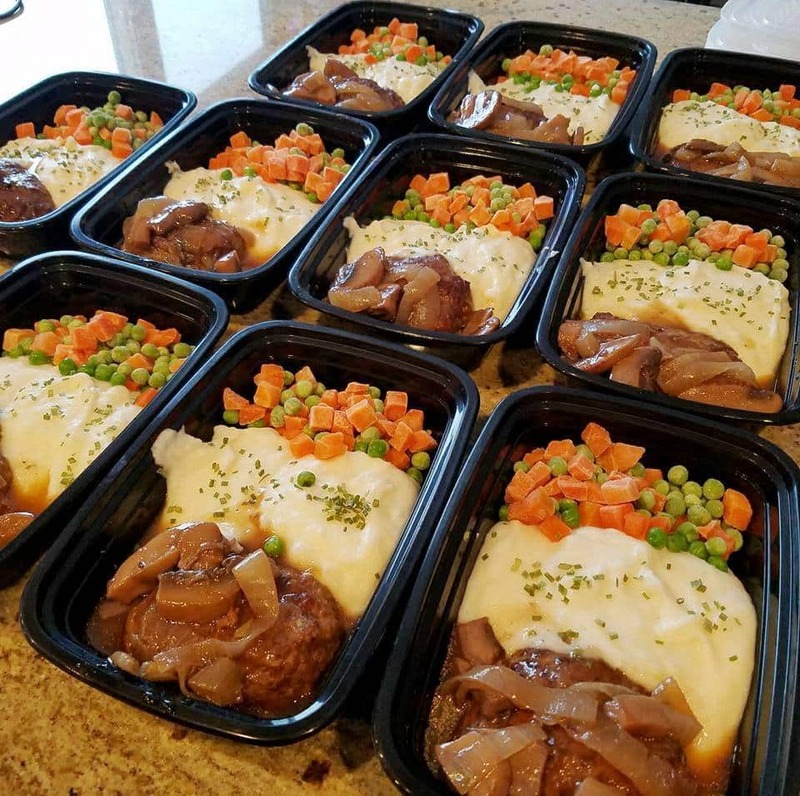 Laura Behrendt, from the This Old Gal Cooking Community doubled the recipe and then packaged up the Salisbury Steak and Pressure Cooker Mashed Potatoes. 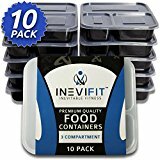 If you want to make your own “TV Dinners” like Laura, here is the link to buy the Meal Prep Containers. How do you make Salisbury Steak in a Pressure Cooker? This is a simple recipe, that comes together quickly and without much effort. The ingredients are simple pantry ingredients. The Steaks will be juicy and covered with Mushrooms and Onions! Dump the ingredients one at a time, into the Pressure Cooker. I like to get things Whisked and ready to go-go! 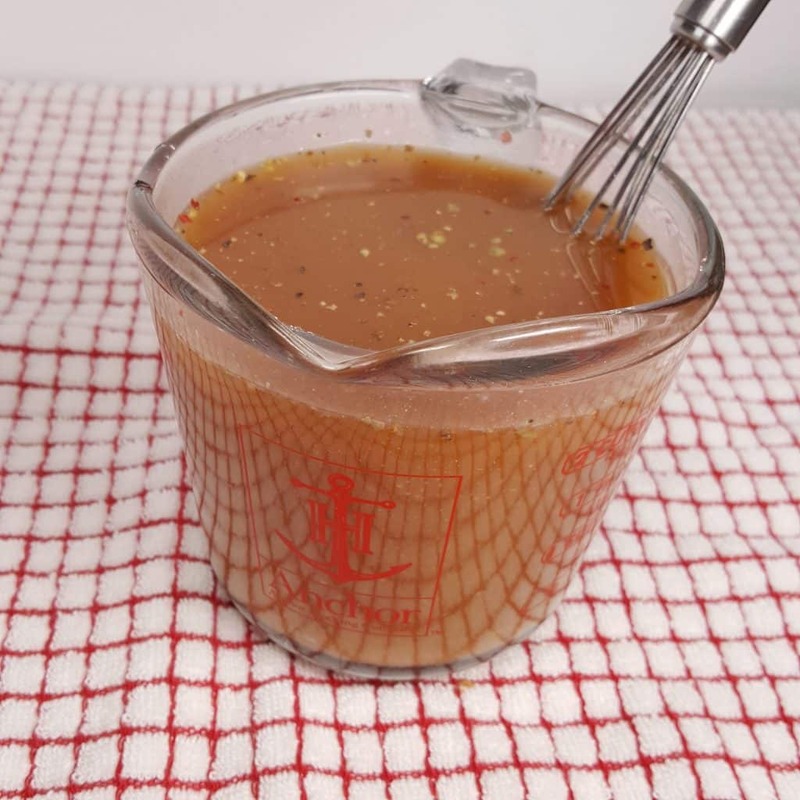 I like using Glass Measuring Cups and my Rösle Stainless Steel Flat Whisk to whisk up gravies and marinade, as there is a convenient pour spout. If you have some of my Homemade Bone Broth, use that. Otherwise, mix together some Better than Bouillon Beef Base and Fresh Water. The measurements are down below in the full recipe card. If you have a Food Processor, it is so easy to just add all the ingredients to it, instead of chopping and dicing onions and garlic, etc. If you don’t have a Food Processor, just dice up the veggies and mix it all by hand. The Beef Bouillon Base, will give the Steaks a deeper and very rich flavor. Make sure to use the Reduced Sodium Beef Base. Divide the Meat Mixture into six Patties. Dredge the Steak Patties through Potato Starch and set aside. This will help get a good Sear and protect the Meat from becoming dense and dry. How do you make a Stainless Steel Pot, Non-Stick? This part of the cooking process, is always important to share. Always, always, heat up a Stainless Steel Cooking Pot or Cast Iron Skillet to the full heat. Add the fat, after the pot is hot. I like using Butter in this recipe, as it gives it a nice and rich taste. If you are Dairy Free or Kosher, try using a good quality Oil, like Kasandrinos Olive Oil, Grapeseed Oil, or Coconut Oil. In batches, place Steaks into cooking pot, Sear well on both sides and remove to a plate. If you wait a bit before trying to move the Salisbury Steaks, they will develop a crust and make it easier to move and flip, without breaking up. The Potato Starch will help protect the Meat and act as a barrier from leaking out excess juice. It a trick I use often, especially on chicken recipes, such as my Pressure Cooker Chicken Piccata recipe. 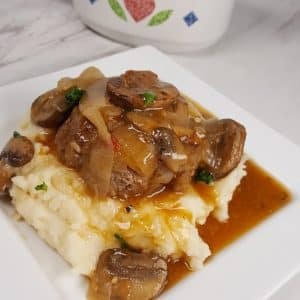 The Pressure Cooker Salisbury Steak will be moist and juicy, plus, it will help thicken the Gravy, without any need for flour. The Gravy will thicken as the Onions break down during cooking and the Onions will become a part of the Gravy. As one who loves Onions, I like to add extra, right before closing the Lid, so that there are nice pieces of Onions in the Gravy. 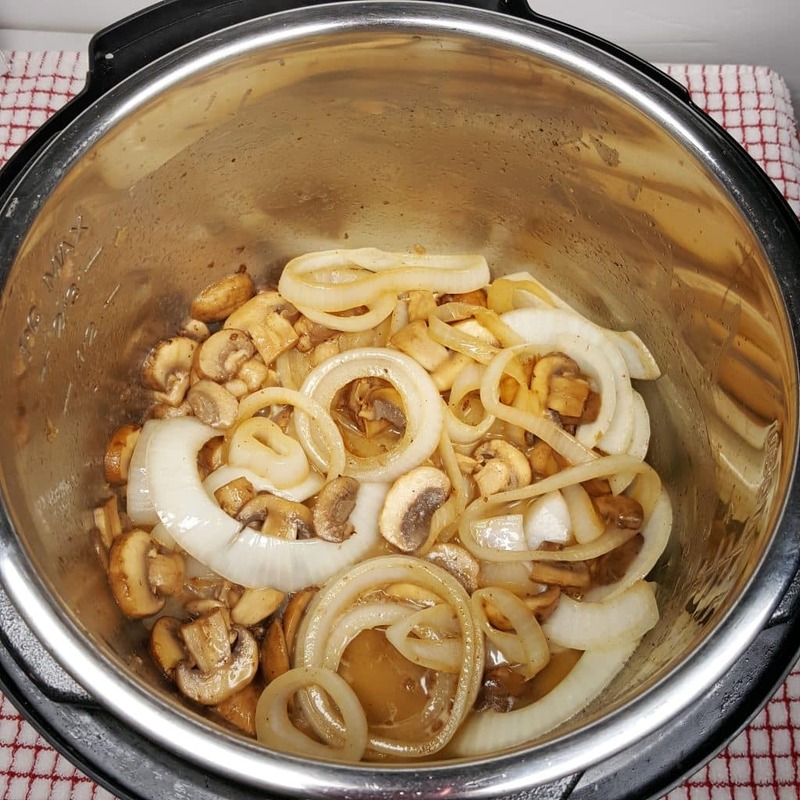 Continue cooking until the Onions are very soft. Red Wine takes the flavor up another notch. Make sure to use a good Red Wine, NOT something labeled “cooking” wine. Use a Spatula and deglaze the cooking pot well, so that nothing is stuck to the bottom. Whisk in the Gravy mix well. It will already be rich and delicious. Take a taste and see if you need more seasoning. Remember, the Salisbury Steak Patties are highly seasoned. 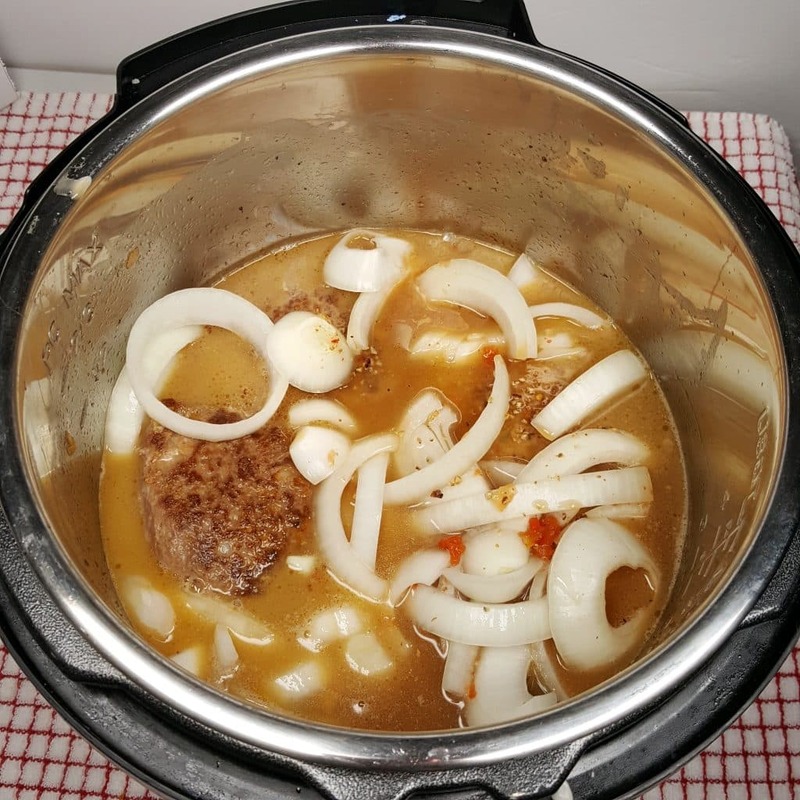 Once everything is in the Pressure Cooker, carefully add the browned Salisbury Steak Patties. If you love onions, add some thick slices to the top. They will stay intact. The Potato Starch will help thicken the Gravy a bit. The Gravy is not supposed to be super thick. Pot in Pot Side Dish! If you want to make your side dish at the same time, now is the time to add it. Place a Tall Legged Trivet inside the cooking pot. Use a Rice Pan on top of the Trivet. I like to use this Stainless Steel Stackable Steamer Insert Pans Set and use the lid with the holes. Add Cubed Potatoes and make a yummy Mashed Potatoes, if you like. If you prefer Rice, check out my Perfectly Cooked Pot in Pot Rice Recipe. This is a great make a head recipe. 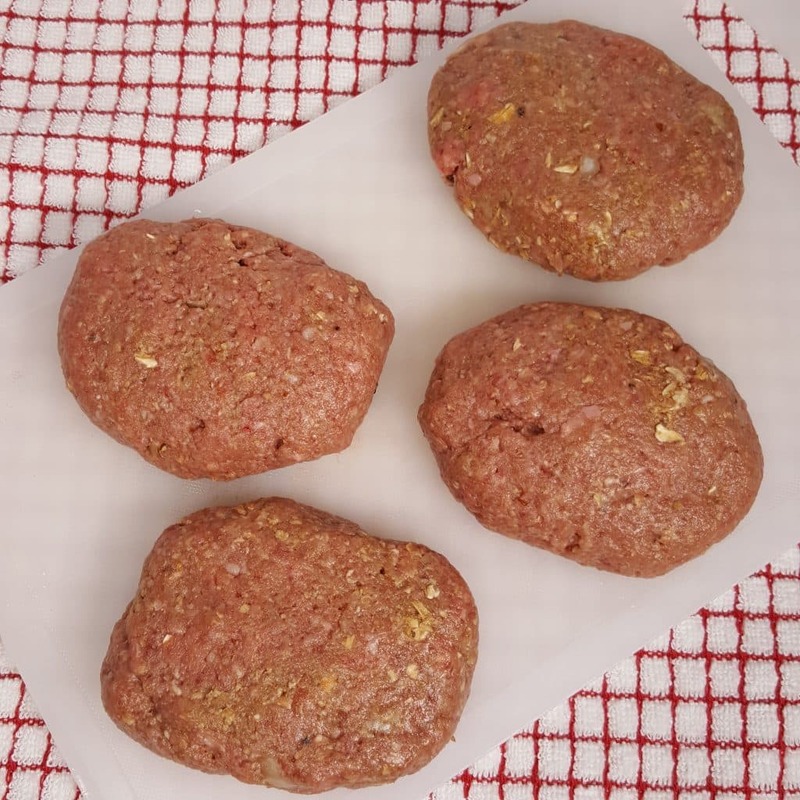 I often times will make a double or triple batch, shape the Patties and package up using my FoodSaver and freeze. 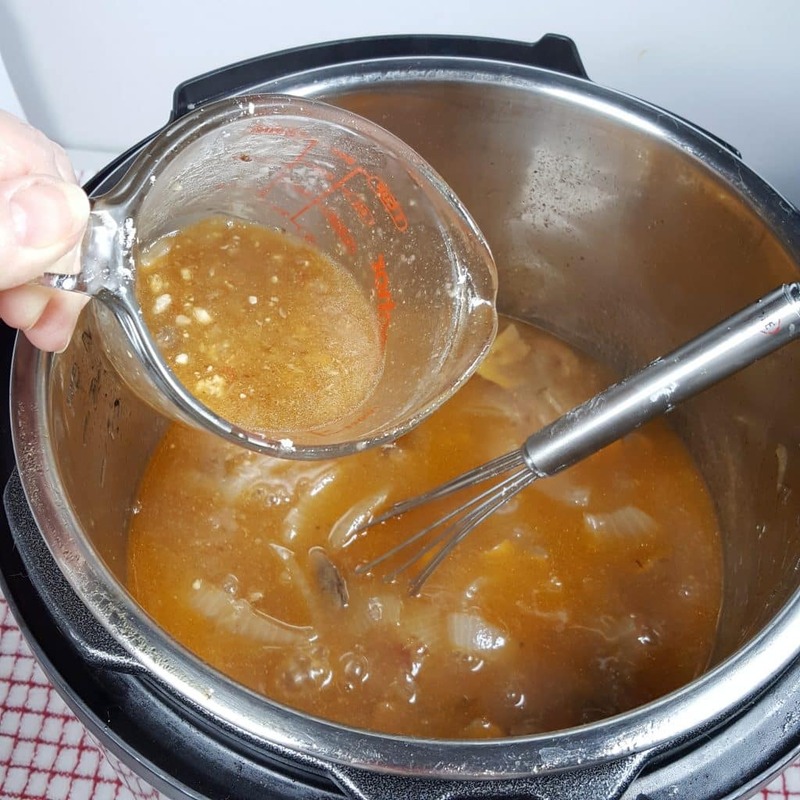 If you enjoy this recipe, you may also enjoy my Pressure Cooker Sloppy Joe recipe. They are both comfort meals that take you back in time. 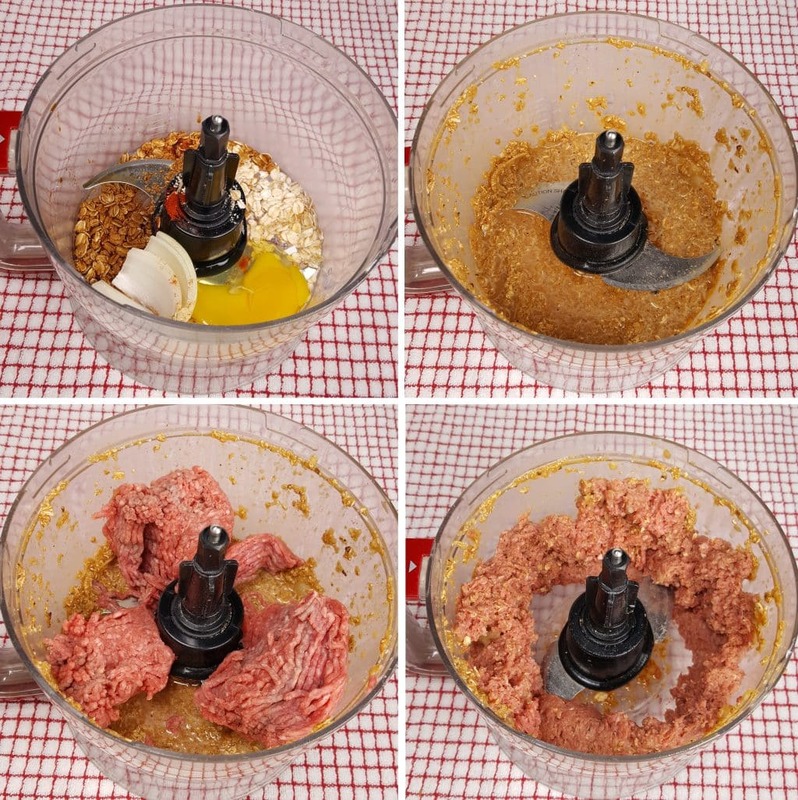 Use a Food Processor to mix the Steak Patties. Add all ingredients, except Beef and process until very well chopped. Add Beef and pulse until well combined. Shape Beef Mixture into 6 oval, flat Steaks. Dredge Beef Steaks through Potato Starch and shake off excess Starch, if any. Select Sauté/Browning and heat Pressure Cooker until fully hot. Add Oil and swirl to coat bottom and then add 2 Tablespoons Butter. In batches, place Steaks into cooking pot, Sear on both sides and remove to a plate. 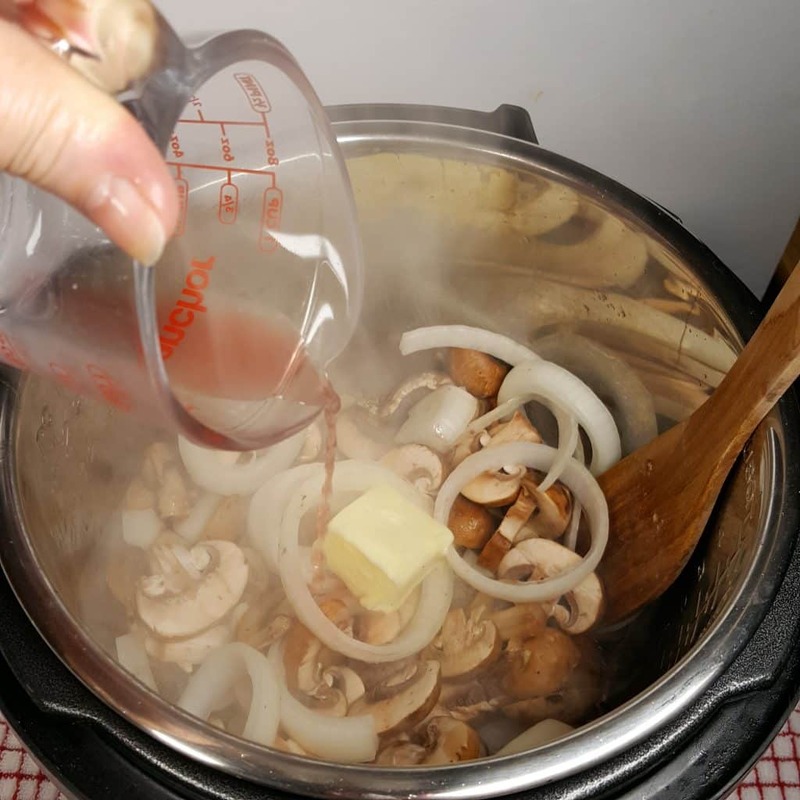 Add 2 Tablespoons Butter, Mushrooms and half the Onions and cook until Onions begin to soften. Add Red Wine and deglaze cooking pot, making sure to scrape up any stuck on brown bits. Continue cooking until Onions are soft. Pour Gravy mixture into cooking pot and combine. 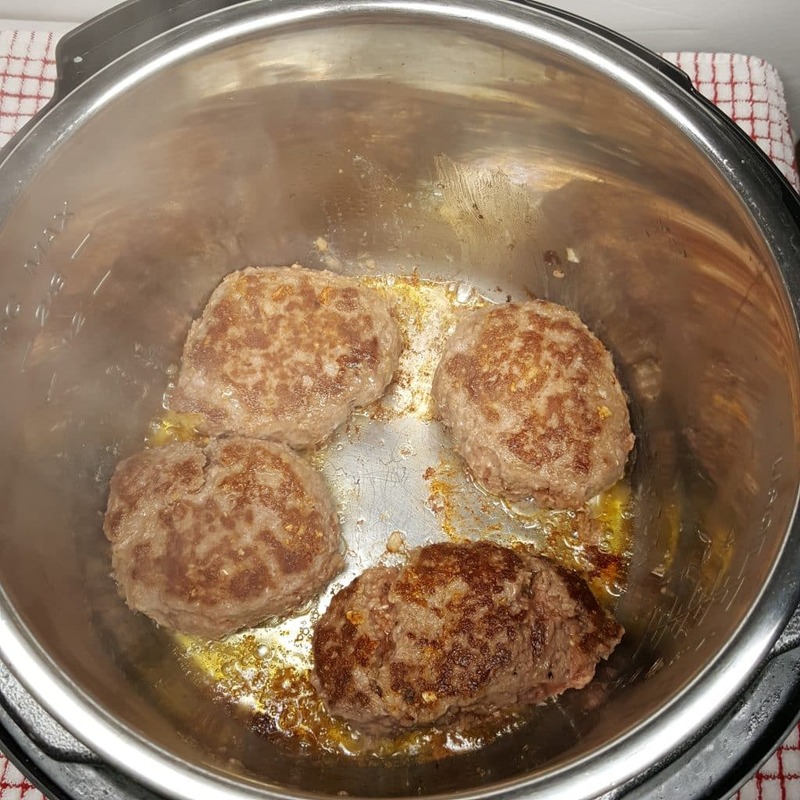 Carefully, place Beef Steak Patties into cooking pot. Cover with the rest of the Onions. Remove Steaks. Turn off Pressure Cooker and select Sauté/Browning. Simmer to thicken. Better than Bouillon Beef Base is my choice for the best Flavor Bomb. It gives the Steaks an intense beef flavor. Beef Bouillon Granules, Powder or Cubes can be used. **** Processing the Steak Patty ingredients in a Food Processor helps the Patties to stay together nicely, more like a steak than a hamburger. If you don’t have a Food Processor, dice the Onions and Garlic as fine as possible. PIN this PIN Pressure Cooker Salisbury Steak w/Onion Mushroom Gravy! Great looking recipe with comfort written all over it! Do you freeze the patties cooked or raw? 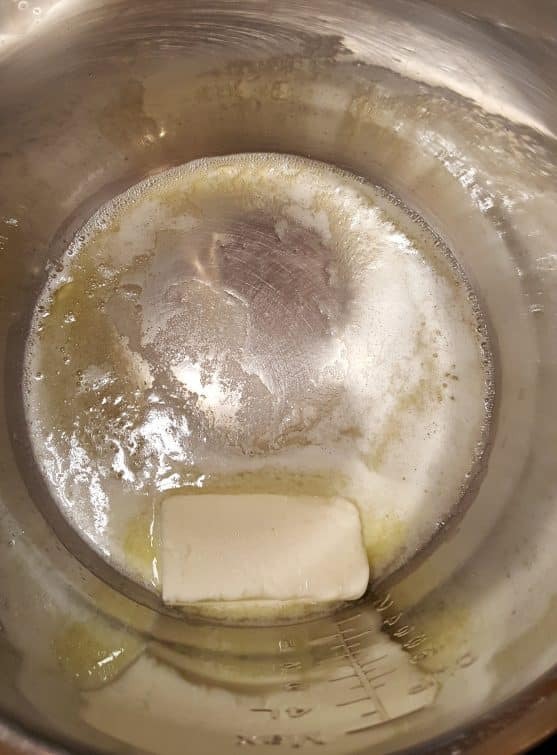 Could this be frozen after completely cooking? I remember TV dinners all too well, but always liked Salisbury steak. Your recipe sounds great and I love the photos. Do I need to modify the cooking times for my stovetop pressure cooker? I’m not ready to buy an electric pressure cooker, yet. I hope someone gives you an instant pot for Christmas as they are awesome! 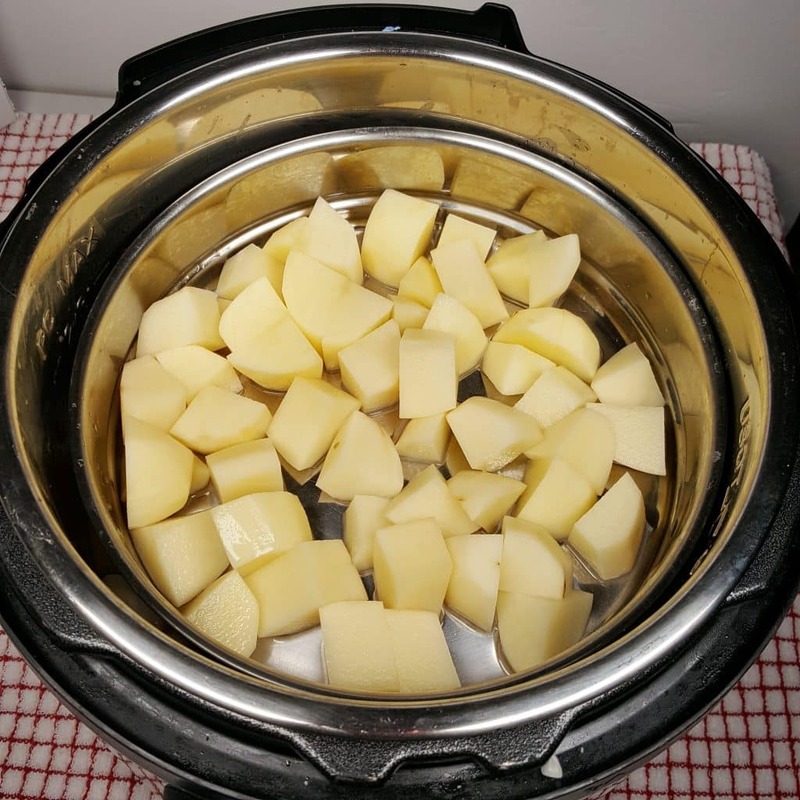 I agree..I’m an old gal too and just got an instant pot..omg..its the best.. you will love it.. just be sure tolook up recipes, dont just wing it like my friend did..
Jill, could you please explain the cooking times for making this recipe while cooking potatoes (for mashing) at the same time? It will be my first attempt at pot-in-pot. Thanks for all that you do, there’s lots of us out here who really appreciate it! Thanks for the reply! I’m still a little confused, the recipe above calls for 4 mins at high pressure with 10 mins NPR, but your mashed potatoes recipe calls for 7 mins at high pressure with 10 mins NPR. I’m wondering if I should cook the potatoes first, then add the rest? Seems to be a 3 minute difference. Thanks. Cook potato’s and keep warm in oven. I just made the Salisbury steak, with a few moderations. I didn’t have potato starch, I used arrow root. I didn’t use a food processor, just mixed the hamburger by hand. Absolutely the best Salisbury Steak I ever had. Question, could you double the gravy? Hello, looking forward to trying this with the potatoes in the IP at the same time, but like Thea, I am confused about the cooking time with both the meat and potatoes layered in the pot. I’ve reread the recipe card and the cook time appears to be for the meat only. Will the potatoes cook in that time? Their recipe card indicates a longer time is needed. Looks so good, looking forward to trying it. Unsure of the cooking time with the potatoes added, went ahead and made the recipe without the potatoes in the pot, but cut into smallish pieces and boiled on the stove. They were ready at the same time. Make this recipe! It is incredible. I’m beginning to realize that the best part of the IP is not so much the speed, but the depth of flavour. Thanks for sharing this, it will be a regular for us. Our comments must have crossed in cyberspace. Next time I will add the potatoes realizing now that the cooking time stays the same, with or without. Fantastic recipe. I was wondering if this recipe could be made using ground turkey (and chicken broth, etc) instead of red meat? Would the cooking time need to be changed? Thank you! I haven’t tried it myself but I don’t see why it would be an issue. However, please understand that it is very difficult to give exact advice for a new recipe without recipe testing. Made this last night without adding anything but didn’t have any red wine. Even so the dish is fabulous and without doubt the best pound of ground beef I have ever eaten. My wife said every man should make this for dinner on Valentines Day and the world would be a happier place. I couldn’t find potato starch at my store but I do have corn starch. Can it be used instead in all places that call for potato starch? I want to try this recipe soon, but right now I have three homemade, leftover hamburgers that I want to reheat in gravy. I have a set of Stackable steamer pans I can use. How long to reheat in the IP? Should I use pressure cook or steam? This was delicious! Made with your Mashed Potatoes. Frankly, I never had Salisbury steak that tasted this good before! I followed the recipe, but it would have helped if the 2 tablespoons of potato starch were showing at the end of the Patties section, or specified that they were for dredging. I pulled out more potato starch for dredging, then when I noticed the ramekin with 2 tablespoons of potato starch, I blended it in 1/4 cup of water and added it to the pot after releasing pressure. I made the Salisbury Steaks last night — fantastic! I used rice flour because I couldn’t find potato starch and I would omit the brown sugar next time (it’s optional anyway). I cooked little potatoes in the steamer right on top of the steak and then smashed them to go with. This recipe made a LOT of gravy — and in this household that’s a good thing. It sounds like a lot of ingredients but they were mostly things I had on hand. I will definitely make this again and again. Jill, I freely admit to sometimes (maybe even more often than not) sacrificing a bit of nutrition for taste. For instance. I use bacon drippings to flavor vegetables, a lot. OK, that disclaimer is out of the way. Now, what is this thing with potato starch instead of corn starch? Is it just personal preference? Or is there some nutritional advantage to the potato starch? Potato starch is not easy to find here in Mobile, Alabama, but everybody carries corn starch and I’ve used it for many years as a thickening agent. Is there something I should know about that? I plan to use your Salsibury Steak with onion-mushroom gravy soon (like in the next two or three days). I’ve always liked Salisbury Steak and this gravy sounds great. I really like your recipes in my Mealthy pot. This was EXCELLENT. So tasty. Every thing was rich with flavor the meat and the gravy. Will make over and over. live on a farm in the country and have only a small store, will corn starch replace potato starch in this recipe, or even AP flour? This was delicious!! My husband ❤️‘D it!! I used venison and you’d never know. I didn’t have a couple of ingredients, like mustard seed for example but it didn’t matter! Will def make again! Would corn starch work as a substitute in this recipe? This is the perfect comfort food! Easy to prepare and tasted great, but definitely took longer than 20 minutes to prep when you include getting a good sear on the steaks. I served it with mashed potatoes and steamed green peas made PIP. I love the idea of making patties up and freezing them for a quick weeknight dinner. This is in my Instant Pot as I’m typing. I noticed my patties before searing were quite moist and didn’t want to hold together. I blame this on the fact that I didn’t have Worcestershire sauce and used some Worcestershire powder plus a little water instead. Everything smells divine! I look at my kitchen and think I used all my dishes, but that is just because I didn’t prep my ingredients ahead of time and needed to get clean measuring cups and spoons for everything 😉 Thanks for yet another fantastic recipe! Making this right now…while I like idea of food processor to mix things up, I think maybe next time I’ll mix everything in with meat in separate bowl by hand. The patties are rather moist and falling apart. Something told me that was going to happen. Flavors are awesome though. Serving it over egg noodles though because that’s what I have on hand. Really fantastic recipe!.Congrats well done.I have a one tempreture electric pressure cooker so was concerned about it being tough so I just did a total of 7mins only-which on mine is 7mins on high.Perfect.Delicate tender baffleingly good.You would never know this was ground beef at one time.The texture is divine.Also I was concerned about all that liquid so I just made about 30% less-about 1 3/4 cups total.That worked well.Also had no potato starch so I just dredged the patties in lots of Kamut flour and because I had made less sauce it seemed to thicken up perfectly also great I was too lazy do what your lovely recipe said-I was very happy that my shortcut worked.Im incred impressed.Thank you!. Another delicious recipe from TOG!! Made this tonight for dinner. Mashed potatoes with the wonderful gravy. And enough left over for 2 frozen meals.